My name is Nilsa de Deus; I am a Researcher and also Head of the Research Department at the Instituto Nacional de Saúde (INS also known as National Institute of Health) in Mozambique. I first came into contact with COHRED a year or so ago when our organisation was busy trying to work on the set-up a National Health Research Agenda for Mozambique. I personally found this area of my work (concerning the set up of the National Health Research Agenda) to be interesting, but I was also struggling with some elements of the agenda, for instance, on identifying and setting up national priorities. As a blessing in disguise, this was also around the same time that COHRED’s Sylvia de Haan was scheduled to visit Mozambique. My boss and I met up with her and she explained to us how COHRED works – particularly with regard to supporting country-led efforts aimed at strengthening research and innovation systems for health. I had already heard about COHRED and I had also read-up on their work. I remember thinking to myself ‘wow’ this is exactly what we need. Soon after the meeting, my boss gave me the green light to go ahead and work with COHRED. The first thing we did was to identify the key-steps that would be necessary for us to go through in order to set-up our national health agenda. We had to have a proper plan in place – and this included having to agree on a joint work plan with our colleagues from the other national-level organisations and institutions. 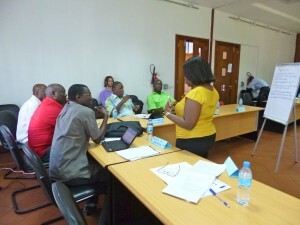 One of the other things that worked well as part of this process of identifying key actions on things to do, was the dialogue that we had with other researchers, institutions, civil society organisations and policymakers – all of whom were now slowly, but surely making contributions towards our efforts to set-up a health research agenda for Mozambique. Mozambique had been trying for ten years to set up a research agenda. Now, we have at least a draft. And I can tell you that this would not have been possible without the support, guidance and advise of the team at COHRED. Simply having someone who can give advice and someone that you engage with on a technical issue – helps a lot. I remember that at some stage we had a long wish list on the research needs for Mozambique. However, working closely with COHRED’s Kathy Douglas it soon became apparent that we had to set-up some priorities. It is at this stage that we worked through some questionnaires that were then shared with researchers for their inputs on Mozambique’s research for health priorities. COHRED’s expertise, tools and resource materials in this area came in handy given that we were than able – through a workshop – to get the researchers themselves to come-up with the priorities. They came up with a priority list on research for health and they even managed to rank the items on the list. Everybody at the workshop got involved in the discussions concerning the National Health Research Agenda and its implementation in the country. Three of our top institutions in the country including INS are now in discussions with COHRED on how they could potentially use RHInnO. I hope that in the next year we will have a success story on this. And I am sure that if these three institutions see the benefits of this system, the others will follow. I think RHInnO will also help our institutions to work together, instead of us working as individual institutions. This is a key issue in Mozambique. We have to learn how to work in collaboration with each other and also how to network and share experiences within the country and even within the same institution. Having said that, there have also been some lessons to learn from in our engagements with COHRED. One of these is that both INS and COHRED need to be more realistic about the challenges and pace with which we can get national efforts off the ground. I can confidently say that our work with COHRED is definitely making a difference in our national efforts to set-up a National Health Research Agenda and to strengthen the health research governance in Mozambique.